I’ve been focusing on ring work with Tristan, doing our homework from our lesson: responsive to driving aids, maintaining tempo, putting him forward into the bridle rather than riding backwards. We’ve been trying to get forward-without-fast in the canter in particular. Sunday I went down to GMHA to volunteer again for P&Rs for the 25/25/50 CTR ride that Hannah wrote about here. 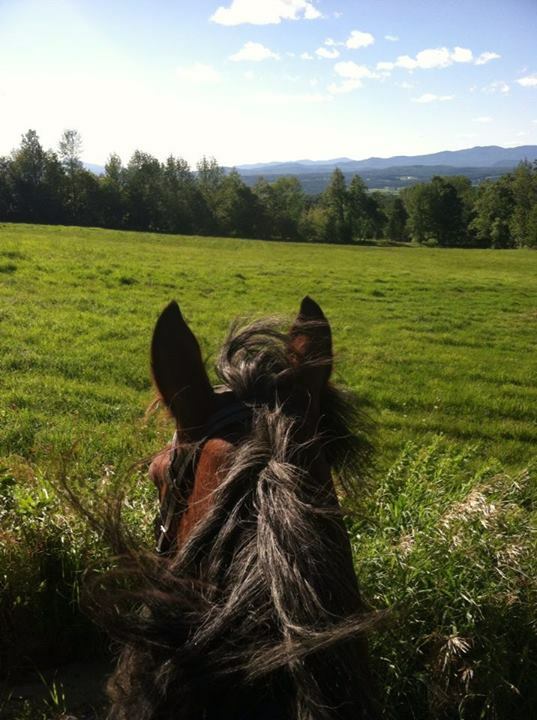 Gorgeous, perfect day, wonderful horses, and I got very wistful about being out and about. I think Tris would be a great CTR horse. I’d like to be less homebound now that he’s back to 100%. I’ve been dragging my heels on this more than a bit – I haven’t re-registered my trailer in Vermont (10 months later…) and it needs a check/inspection. My savings still haven’t quite recovered from his surgery and vet bills, but I hope soon – maybe September – to get up to that. There are some GMHA rides coming up that we could swing. On that note, last night I got to the barn after a full day of work on my day off and pulled out our jump saddle and we hit the roads. We did mostly walking, some trotting on flattish sections, and all in all spent about 45 minutes doing about 3 miles. Probably 85% of it was some kind of grade, some of it quite steep indeed. On the flat and lightly sloping sections where we trotted, he really settled into a nice big road trot, and while I took a firm grip on the reins he never offered to canter; he was just motoring along. We finished with a bit of a hand gallop up our favorite hayfield hill, and one benefit of riding in the jump saddle was that I could do a proper gallop position and bridge my reins which seemed to give him a flashback to conditioning for events last summer. ZOOM. For the first time, too, I had to pull him back when we cleared the pasture instead of urging him forward until we cleared the fenceline.